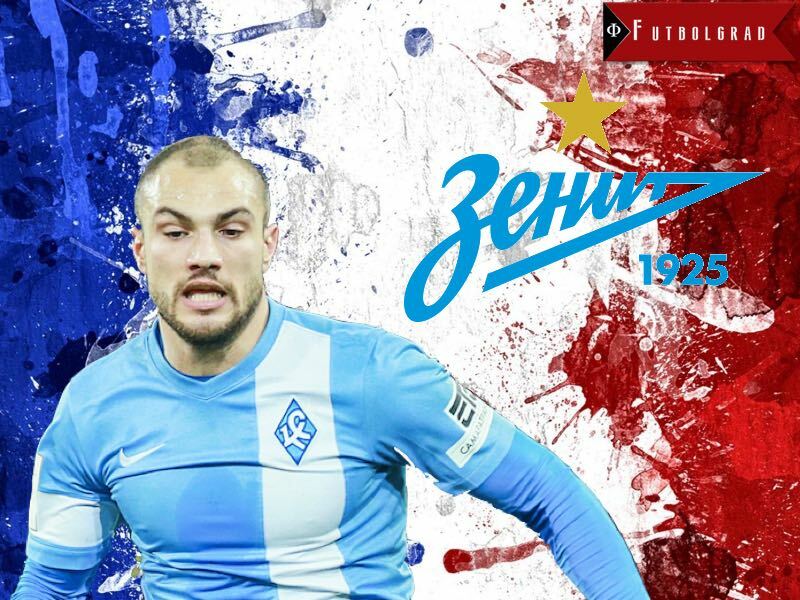 Back in the 2016-17 winter break when Zenit St. Petersburg signed Yohan Mollo from Krilya Sovetov, I wrote a piece for Futbograd describing him as one of the more intriguing signings of the break—though one that would not necessarily be successful. Mollo was intriguing because of his skill and dribbling (I remembered well how he’d taken apart Zenit seemingly single-handedly in his first game for Krilya). His rent-a-quote nature (sample quote: “I hated football when I first played”) and determination to be centre-stage—probably a necessity if you want to make it at Zenit. An early sign that it might not work out, though, came when then Zenit manager Mircea Lucescu did not include Mollo in the side’s Europa League squad. Despite the fact that Mollo was a player who, though not an immediate first choice in an expensive Zenit team, could cause tired defences problems with his dribbling late in games. Mollo’s Zenit career never got off the ground. Mainly limited to brief substitute appearances, he started just one game and featured in seven overall. As Zenit’s remote title challenge faded and they finished outside the Champions League spots, fans began questioning the judgement of Lucescu in making new signings that even he seemed to have little faith in. This summer new Zenit manager Roberto Mancini quickly set about dismantling the disappointing team of his predecessor. Mollo was relegated to Zenit-2, who play in Russia’s second tier, and though he said he wanted to stay and prove himself, he was soon heading for the door. During a Zenit-2 league matched he showed Zenit fans the middle finger following offensive chanting from them (suggesting, in derogatory terms, that the player was gay after he posted Instagram footage of himself kissing a man who later turned out to be his father). Mollo claimed the fans had been joking and so had he, but was hit with a suspension and at the end of August, his contract was cancelled by mutual consent. Ultimately Mollo was a player central to the cause at outsiders Krilya Sovetov but was not up to the stiffer challenge of breaking into the expensively-assembled Zenit side. What should Fulham fans expect? On the pitch there should be plenty of skilful dribbling; Mollo also passes the ball well and crosses dangerously. His style of play reminds me of another successful winger at this level, Brighton’s Anthony Knockaert. Mollo has the advantage of being better at playing a sensible final ball than Knockaert (rather than trying to beat every player and score himself). In the faster and more competitive Championship, it remains to be seen whether Mollo has the pace and work-rate for a sustained run in the Fulham first team, as well as the ability to keep out of trouble (he tended to foul opponents lot in Russia). Off the pitch Mollo will likely be as interesting – despite not playing much, he did plenty of interviews at Zenit, came up with more than the standard bland quotes and even managed some of these in Russian. Whether Mollo is a Premier League player is another question, but as Fulham look for promotion this season they have signed a player who, if he feels a big part of the setup and is given some creative freedom, could make a real difference.